The attacker has a long history of helping those in need. FOOTBALLERS HAVE A reputation as being a pretty spoiled lot – motivated by money, flash cars and snazzy clothes. But sometimes, there’s a diamond in the rough. Steven Naismith has been helping Glasgow-based charity Loaves and Fishes since 2010, while still a Rangers player. But, despite his subsequent move to Everton, he is still heavily immersed in charity work. 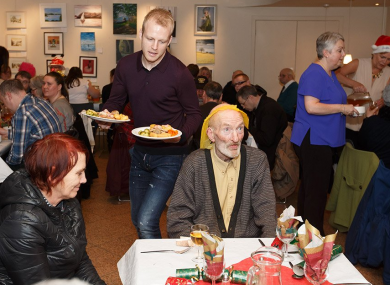 He has continued to fund Christmas lunches for Glasgow’s homeless community and has supported the same initiative at Liverpool’s Whitechapel Centre for the last couple of years. On Wednesday, he headed north of the border to help serve those in need. “It is both humbling and inspiring in equal measure,” he said. Over the years, I have had the opportunity to speak to the people who come to Loaves and Fishes. Many of their stories make difficult listening, because of the severity of hardship they have endured. It’s a very small gesture for me but I’m always told how much it means to them.” Naismith has made some genuinely fantastic gestures in recent years, including providing Everton match tickets for unemployed fans. He has also backed a project in Scotland which serves to help ex-servicemen return to civilian life. Email “Steven Naismith shows he's football's nicest guy by feeding the homeless in Glasgow”. Feedback on “Steven Naismith shows he's football's nicest guy by feeding the homeless in Glasgow”.